At the intersection of Queen and South Streets in Kakaako—is perfectly suited to downtown professionals and city dwellers. 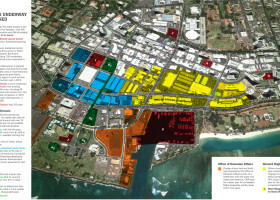 It’s within walking distance to the business district, Restaurant Row and Ward Centers and a short drive to Ala Moana. Built in 2008, Keola Lai still feels shiny and new, with an open, well-appointed lobby (interior design was handled by Philpotts & Associates) and all the requisite amenities—65-foot swimming pool, a separate wading area for kids, whirlpool, fully equipped fitness center, Weber barbecue grills and a community room that can be reserved for meetings or parties. Design features include eight-foot ceilings, designated dining areas, double-pane, low-E glass windows, central AC, porcelain tile floors in kitchens and bathrooms, stainless-steel appliances, granite kitchen and bathroom countertops, maple or cherry kitchen and bathroom cabinets and walk-in closets. Some of the units have lanai.